This post contains affiliate links and sponsored products. Thank you for supporting the brands that make this blog possible! So I know this One Room Challenge reveal is a couple of days late, but lets go ahead and blame that on the fact that I'm SUPER pregnant. As uncomfortable as the 9th month of pregnancy is, I'm so glad baby boy stayed put until now! I've been super active trying to get all the things done before his arrival, including this sweet little nursery. 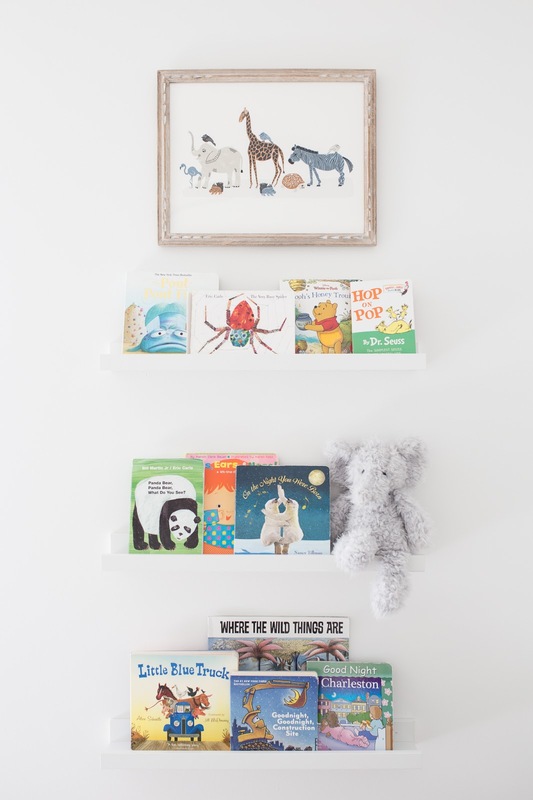 I wasn't sure we'd be able to pull off finishing this nursery between the four (yes... four! ugh) coats of paint it took to cover the grey walls and our first ever built-in closet shelving project, but I couldn't be happier with this space. So what didn't get done? Curtains and a new light fixture. We need a fan in this room because of the amount of light it gets for most of the day and I just can't find one I like! And as for the curtains, I'm going to work on some tassel trimmed blackout curtains during my maternity leave... hopefully! Anyway, on to the fun stuff... get ready for picture overload my friends. Rug. Pouf. Knit Blanket c/o. Rocker. Art Print. Side Table. Lamp. Pillow Fabric c/o. 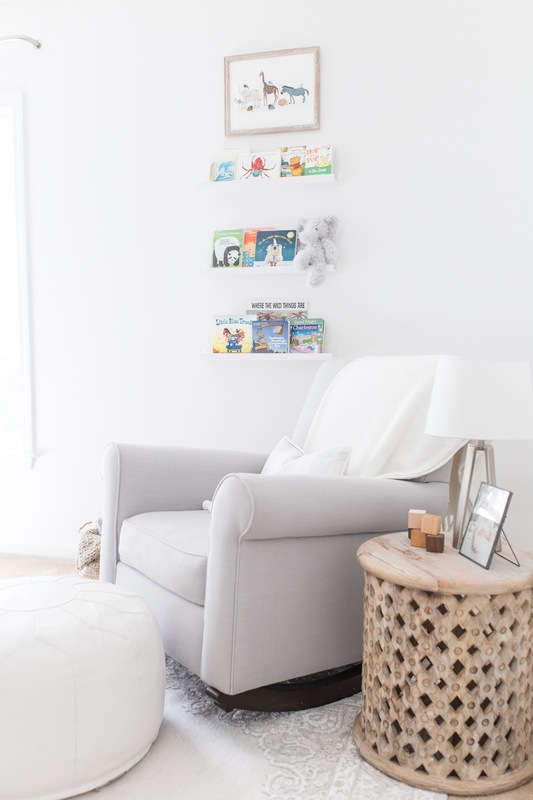 We used this Pottery Barn Kids Charleston Rocker in Rowan's nursery and its been SO worth the money. 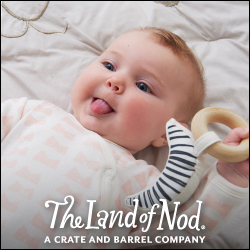 We invested in that and saved on other things like the crib (which we also love) and I highly recommend! I've mentioned in the past that as soon as I found out we were having baby boy #2, this quote and gorgeous sign just stuck out and I knew it needed to be in this space! Also I can't get over how amazing the quality is! Solid wood and the perfect amount of distressing. P.S. If you're worried about hanging something heavy like this sign above a crib I highly recommend this security hardware. I installed them on my own at 38 weeks prego and let me tell you, that sign is not moving! Sign c/o. Crib Sheet c/o. Bumpers c/o. 20" Crib Skirt c/o. 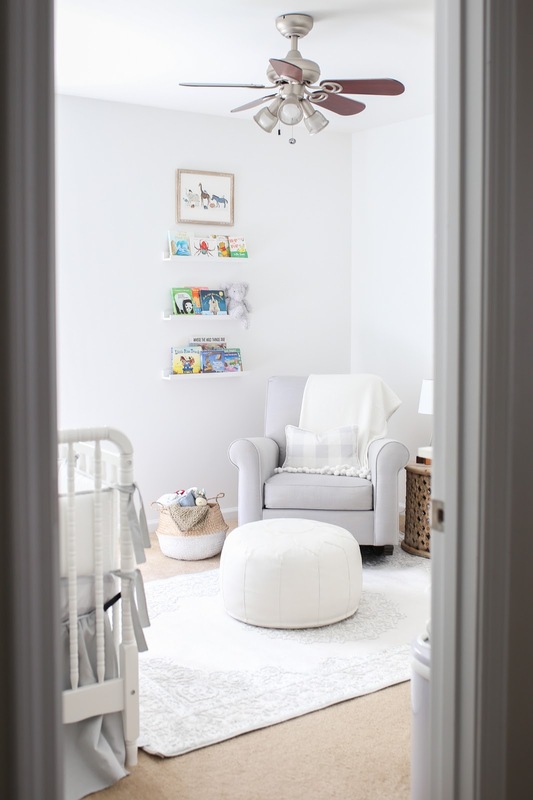 Carousel Designs graciously provided the bedding for baby #2's nursery and I can't say enough how impressed I am with their fabrics and the whole designing process! I ordered free fabric swatches before deciding, which ended up being really helpful. You can even order just the fabric, which is what I did to make the lumbar pillow on the rocker! I loved the Nursery Designer where you can mix and match patterns and see what the bedding will look like put together. I ended up with the French Grey buffalo check, antique white and silver gray linen trimmed bumper, and extended (20") gathered crib skirt in silver gray linen for a classic look! Don't worry, the bumper will be removed until he's old enough for it to be used safely!! 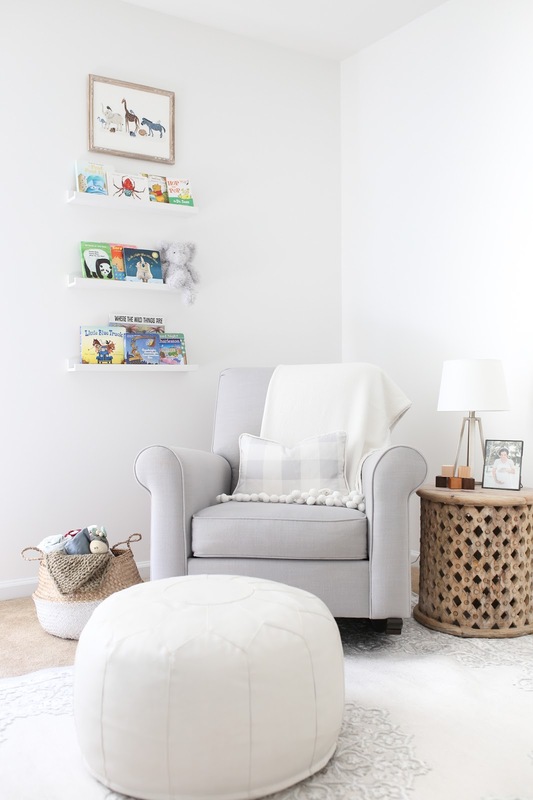 Since we kept the layout of the furniture the same as it was with big brother's nursery, it made this little reading nook really easy to style! I knew I wanted a new art print though, since I moved almost all of the wall decor into Rowan's big boy room. 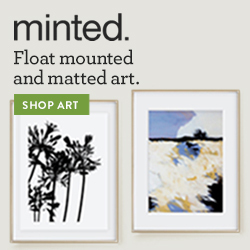 This Minted Art Print was the perfect addition, I love the colors with the light wood frame! On the other side of the room is the dresser and changing table. I had such a hard time deciding what to do around the mirror (do I go with a gallery wall or leave it blank?!) so when I decided on a mobile I thought the changing table would be the perfect spot! Mobile c/o (Also similar). Changing Pad Cover c/o. Mirror. Alphabet Wall Art in 'Frosted Ash' c/o. Dresser. I love switching up the location of this Pehr Designs Counting Sheep mobile... usually you see mobiles above the crib but I think he'll notice it a lot more during diaper changes! 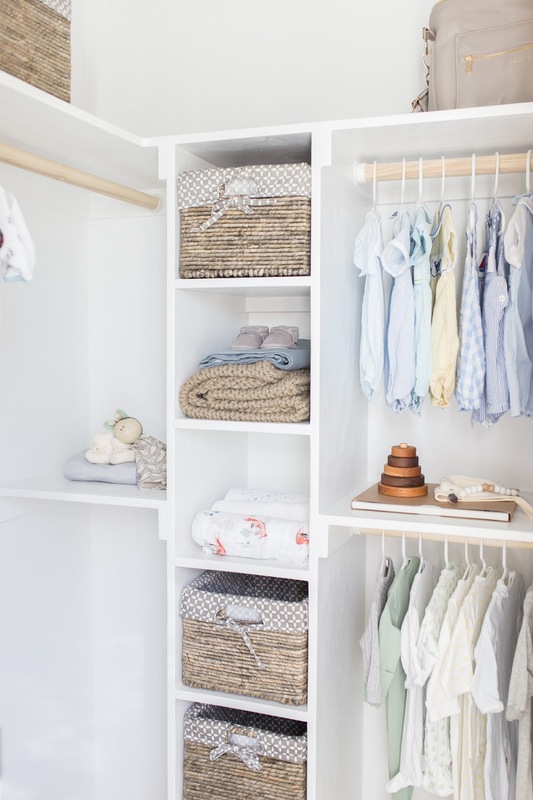 Then of course the closet, which looks a hundred times better than it started and makes my Type A heart happy. DIY Built-In Closet Shelving. Baskets (Marshalls/TJ Maxx). Circle Stacker. 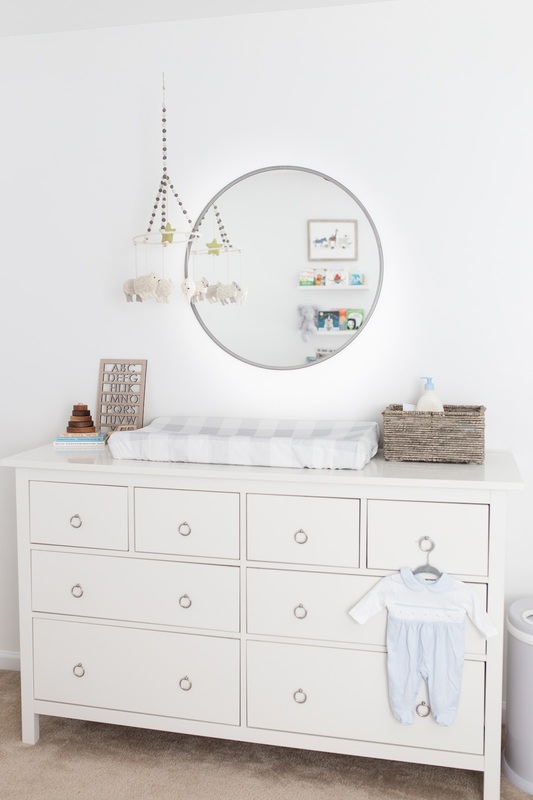 If you're looking for a gender neutral nursery, this is definitely just that! But I personally couldn't love the buffalo check linens or the adventure sign any more for a boy's room! Thank you to those of you who followed along with this challenge and offered advice on IG stories when this indecisive mama needed it!! Also a huge THANK YOU goes out to Carousel Designs, House of Belonging, Pehr Designs, and Little Sapling Toys for generously providing products for this sweet little space. I absolutely loved working with each of these brands and highly recommend them! Make sure to check out the rest of the amazing One Room Challenge reveals by visiting Calling It Home! I LOVE how it all came together!! Simple and classic, so perfect!